$120. Get ready to hear "Goooaal!" The Hose Hockey game is a great way to get team-spirited hockey fun at your event. With no ice necessary, this six-player game is a hit in warm or cool weather! The slick playing surface of this inflatable game will keep the fun going, literally, as six colored hoses direct a stream of air used to maneuver the "puck" across the board and into the opponent's goal. No need for a penalty box, this Hose Hockey inflatable game provides safe and fun entertainment for players of all ages. 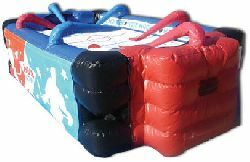 The blue and red color scheme helps players find their teammates, and the compact design makes this inflatable game ideal for events with space concerns.